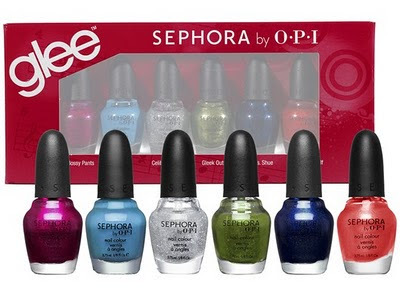 I was so excited yesterday to read about the newest Sephora by OPI collection- Glee! The picture above and info below are from Bright Lights, Big Color. Seven shades available for individual sale will be produced, each retailing for $9.50. Mash-Up, a pearlescent green gray. A mini set of six for $22 will include Miss Bossy Pants, Gleek Out and Slushied, along with three additional exclusive colors: Celibacy Club, a glimmering, diamond top coat; Express Yourself to Yourself, a coral shimmer shade, and Sue Vs Shue, a navy blue. All are dibutyl phthalate (DBP), toluene and formaldehyde free. I am so looking forward to this collection! I believe it will be released in February. I hope you swatch these. They're pretty in the bottle but I wanna see what they look like on a nail.